Monitoring and reducing overheads is an essential practice employed by shrewd Directors in any organisation. For Gordon Pratt, Finance Director at Grove & Dean, one particular cost presented a challenge that will be familiar to businesses nationwide: Merchant Card Fees. As well as being a significant cost to Grove & Dean, the associated contracts and charges are notoriously complex. With renewal quotes on the table, Gordon recognised his in-house team lacked the very specific knowledge required to undertake a review. He reached out to Expense Reduction Analysts (ERA) for expert guidance. With minimum fuss and maximum impact, ERA coordinated a best-fit solution with improved terms and services, topped off with a healthy annual saving. 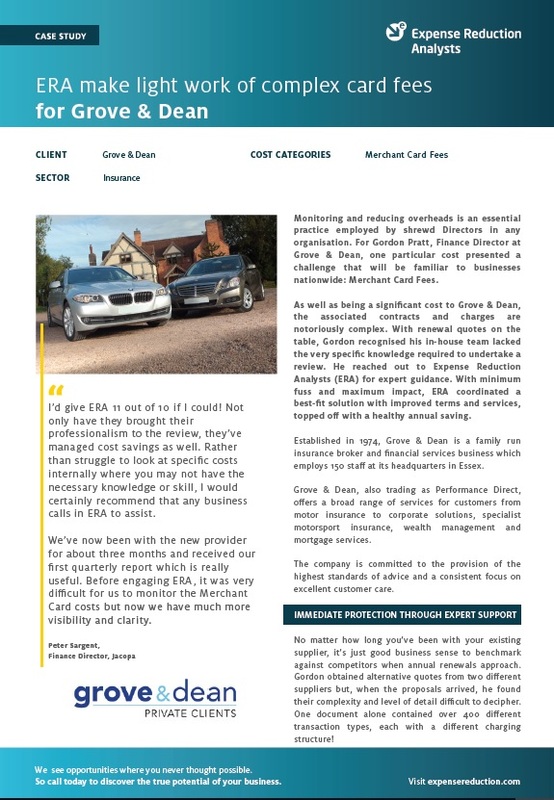 To find out more about how ERA helped Grove and Dean, including results, savings and more details from the client, download the full case study now. Read the full case study working with Grove and Dean. Want to know more about how ERA can help your organisation? Contact us today for more information.